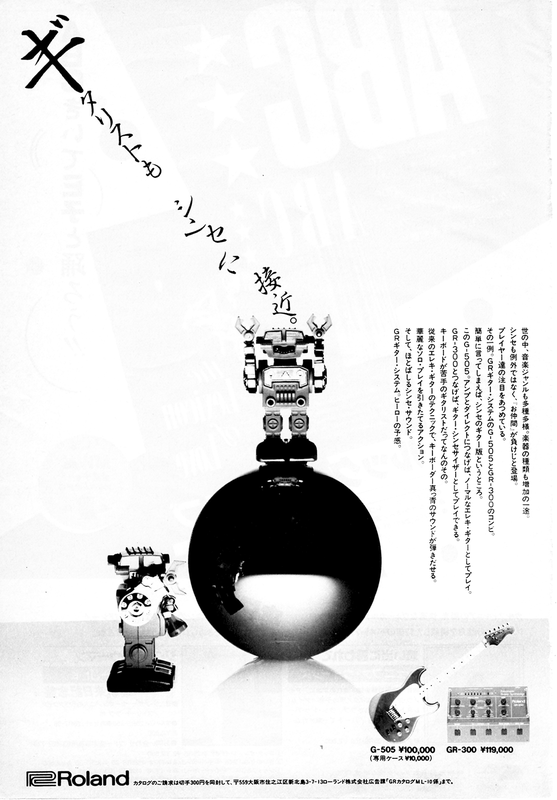 The popularity of the classic garage band consisting of guitar. bass, drums and keyboards will never die. Not as long as there are young musicians willing to struggle to forge ahead in realizing their dreams and ambitions - even if that means rehearsing in the garage for a while. And not as long Roland remains sensitive to the needs of creative artists in the face of the rapidly increasing pace at which today's music technology is developing. Now, at least, classic forms such as the garage band have within their grasp the chance of expanding and re-establishing themselves with a powerful twist: MIDI. With the current additions to its ever-widening line of MIDI instruments, Roland has taken the chance and turned it into a reality, making possible for the first time the creation of a complete MIDI pop band. 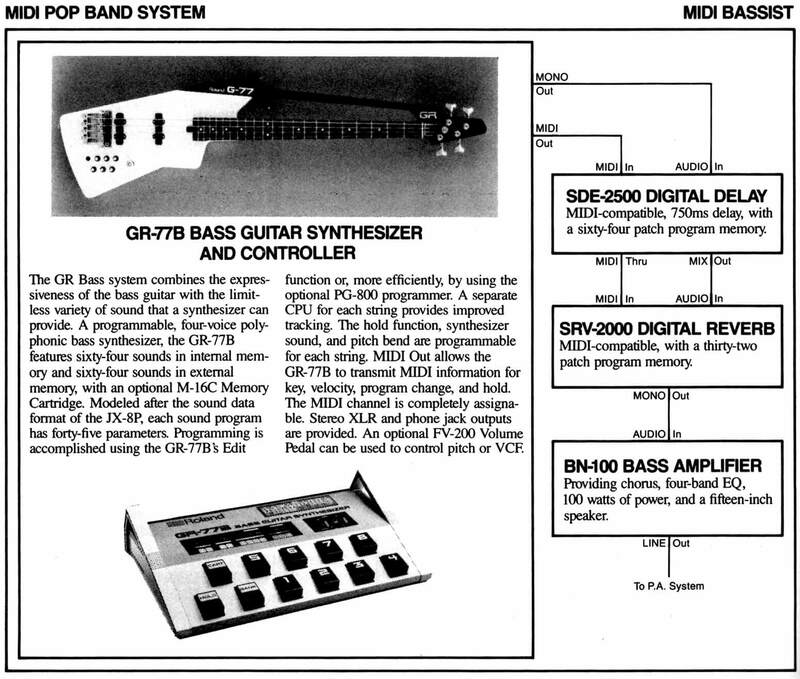 Starting with the GR System - already becoming a classic in its own right - Roland showed guitarists how synthesis with MIDI could expand their range of expression, propelling the guitar a quantum leap ahead as part of a band's instrumental lineup. With your favorite BOSS effects pedals always on hand, the quality of your guitar sound becomes complete with the addition Roland's MIDI-controllable Digital Delay and Digital Re-verb. 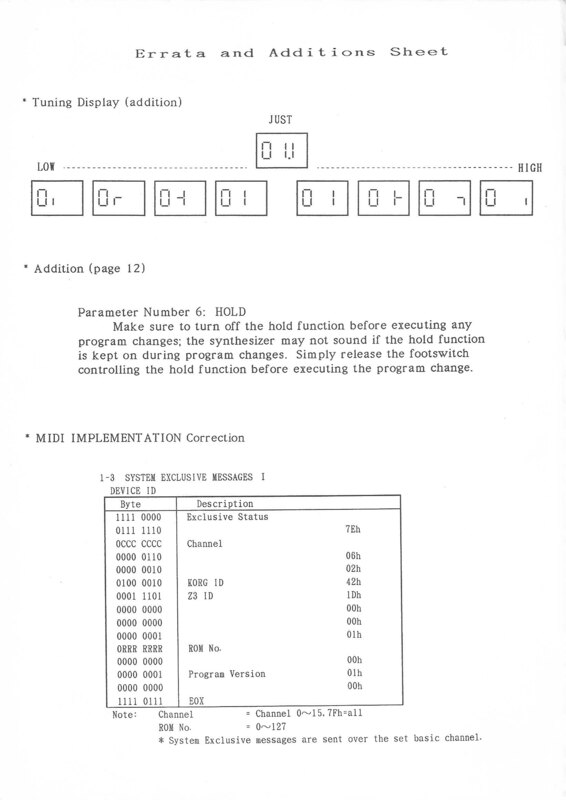 Of course, keyboardists have enjoyed both synthesis and MIDI for some time now. Each year the degree of control expands as MIDI's power is further explored, and more exciting sound modules (such as Roland's MKS series) are added. A keyboardist on-stage setup becomes streamlined with the addition of a MIDI sequencer, reliably controlled an kept spot-on the way you like it with the very affordable SBX-10 Sync Box. Using a MSQ-700, much of a performance can be sequenced beforehand, and the "live" quality of your playing is still captured through MIDI. The need for multiple keyboards to clutter the stage is eliminated. All you need now is one master keyboard to switch between any MIDI sound module you choose while playing live. With only two hands to play with anyway, what could be simpler or make more sense than a centralized control center like Roland's MKS-200 Keyboard Controller? The backbone of every band is the rhythm section, for them Roland introcudes the new GR-77B Bass Guitar Synthesizer, the DDR-30 rack-mounted Digital Drums with the PD-10 Bass Drums Pad and the PD-20 Snare/Tom pads, and the PAD-8 Octapad. Now bassists, drummers, and percussionists can explode into the world of MIDI. Finally the picture is complete. 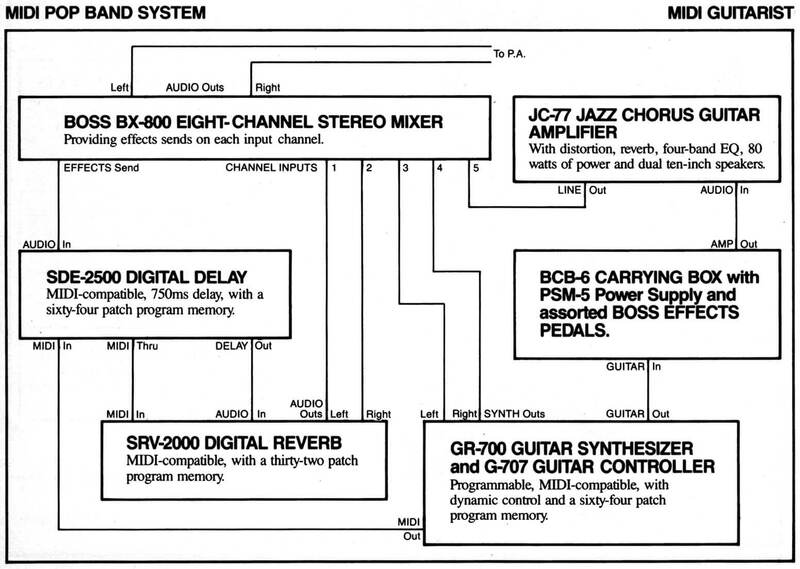 Create a bass sound like no other; store the sounds of multiple drum kits - each unique and distinctive - in the DDR-30's memory (or load in even more from optional memory cartridges); play any MIDI device from the Octapad controller, which features complete MIDI channel assign capability for individual pads, as well as on-board for patch presets. And don't forget about Roland's complete line of quality sound reinforcement and signal processing gear. (If you don't amplify the band's sound properly, all the magic you create with MIDI will fall on deaf ears.) Check out the BOSS BX-8000 Stereo Mixer, the JC-77Jazz Chorus Amp, the BN-100 Bass Amp, the Cube line of keyboar amps, and the exciting SDE-2000 Digital Reverb, both with MIDI, integrated in the diagrams shown. Get souped up to explode with a pop (for popularity in the world of MIDI, with Roland providing the right tools for garage bands seeking a complete creative overhaul.